Meeting alone for the first time, the attractive and soft-spoken Tanaka-kun and Futaba have an instant attraction. An unfortunate misunderstanding drove the two apart, but only time and fate will determine their future. Tanaka insists that Futaba refers to him as Kou, his new name since his parents divorced. He his hard on Futaba, but frequently finds himself comforting her while she discovers the meaning of true friendship. It is time for the final challenge at the class leadership training trip and the team is feeling very positive. Are their egos clouding their judgment? 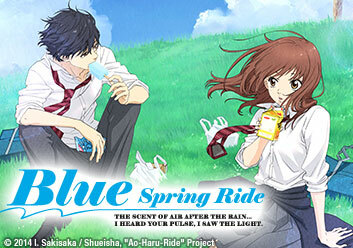 Find out in this episode of Blue Spring Ride! Still conflicted with how to approach Yuuri and Kou with her secret feelings, she wants to come clean, but is it worth potentially losing a friend for a boy that may not even be interested in her? Finally admitting to Yuuri about her true feelings, Futaba is anxious to move a little closer to Kou. Will her efforts go unnoticed or will Kou begin to feel the same way she does? Kou is finally beginning to warm up to his friends and family which lightens everyone's mood and with summer vacation here the possibilities are endless for this group!